The Florida Everglades encompasses vast tracts of marshland. 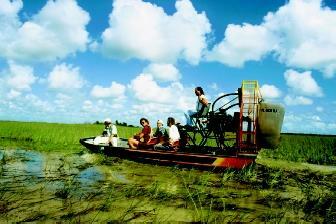 Water conditions can make airboats an ideal mode of transportation to observe and research the vegetation and animals associated with this complex wetland system. plants and animals predominate in southern regions of the Everglades, whereas temperate species are common in the north. Although the Everglades is primarily a fresh-water ecosystem , it also encompasses nearly 196,280 hectares (485,000 acres) of the salty Florida Bay and Gulf of Mexico. The Florida Bay is a shallow salt-water bay found at the southern tip of Florida's 768 kilometer (477 mile) long peninsula, which is bordered on the east coast by the Atlantic Ocean, and on the west coast by the Gulf of Mexico. Its average depth is only 1.2 to 1.5 meters (4 to 5 feet), and 2.7 meters (9 feet) at its deepest point. The bay is cut off from the ocean by sandbars, dense mangrove islands, and the Florida Keys, and therefore has limited water circulation. Just north of the Everglades is Lake Okeechobee, the second largest body of fresh water in the United States. Waters from Okeechobee and many other interconnected rivers, lakes, streams, sloughs , wet prairies, and wetlands from Orlando and regions farther north, and extending to the south of Florida Bay, flow into the Everglades. This combination of freshwater and salt-water systems creates the unique environment that formed the Everglades. The Florida Bay and Gulf of Mexico marine areas and estuarine areas, where salt water and fresh water meet and mix, serve as breeding and spawning grounds for crustaceans, fish, and other species that comprise the Everglades food chain . The fresh-water flow from the Everglades is a vital component to the health of these areas, and also to the islands of the Florida Keys and their world-renowned coral reefs. Unlike most areas of the United States, the Everglades experiences only two seasons: dry and wet, corresponding to winter and summer. The Everglades is designed by nature to experience alternating seasons of drought and flood. The dry winter season, which runs from November through April, brings cooler temperatures and scant rainfall. This dry season is important for many birds' and animals' reproduction. The wet or summer season accounts for approximately 80 percent of the region's average annual rainfall of 137 centimeters (54 inches). Rainfall within the Everglades system can vary dramatically from year to year. Historically, some wet years peaked at over 254 centimeters (100 inches) of rainfall, whereas some dry years received less than 76 centimeters (30 inches). The almost daily afternoon thundershowers and occasional hurricanes bring rains that renew the region's fresh-water supply. More hurricanes have ripped through Florida than any other area of the country. At first glance, hurricanes may appear to be catastrophic storms that only destroy ecosystems. In fact, hurricanes open new areas for plant growth, spread seeds, and thoroughly mix and flush the waters of this shallow region, thereby changing nutrient levels and placement. The Everglades has adapted to this harsh regime of droughts, floods, and powerful storms. Rainfall is the primary method by which water enters the Everglades ecosystem; evapotranspiration is the main mechanism by which water leaves the ecosystem. It is estimated that approximately 70 to 90 percent of the rainfall entering the system is lost due to evapotranspiration. The rates of evapotranspiration vary greatly with the seasons, with higher rates occurring during the hot, sunny summers and fueling the frequent thunderstorms. In the last few million years, the Everglades was repeatedly inundated or covered by shallow ocean waters. This inundation process was repeated five times during the glaciation periods of the Pleistocene epoch, approximately 1.8 million to 11,000 years ago. During these periods of sea-level rise, deposits of sediments settled onto Florida's bedrock base. When sea levels fell, these deposits experienced erosion. Much of the current geography of Florida and the Everglades resulted from these changes. Today the Everglades resembles a flat but gently tilted limestone plate covered with peat and marl . It is upturned on the Atlantic coast by the rocky Atlantic Ridge and at its western Gulf coast by a mangrove and marl dam. Early Florida settlers believed if sufficient breaks could be created in the walls of the natural geologic basin, the center part of Florida would drain and become useful for human enterprises. Originally, the Everglades flowed unobstructed from Lake Okeechobee to the Florida Bay. But during the development of Florida, the Everglades and surrounding areas were ditched and diked , altering the flow of water and its seasonal fluctuations. Much of Florida's early development was based upon draining and removing excess water from wetlands as quickly as possible. Wetlands, specifically the Everglades, were seen as worthless, and it was thought if drained, the land could be put to better use. Initially, agriculture was the main human endeavor conducted in what is known as the Everglades Agricultural Area (EAA). The EAA is one of the major producers of vegetables, sugar cane, sod, and rice. It is responsible for contributing over $800 million to the state's economy. Yet it also is blamed for contributing massive amounts of nutrients and other pollutants into the Everglades system. However, the EAA is not entirely to blame for contamination of the Everglades: bordering urban areas also contribute significant amounts of pollution. As a result of massive drainage projects, mild weather, and beautiful beaches, South Florida is the most densely populated region of the state, surrounding the Everglades with large urban areas. And still, development continues. Governor Napoleon Bonaparte Broward was elected in 1905 based on a platform to drain the Everglades; subsequently, development of one of the world's most extensive "plumbing" systems began. This system includes more than 2,000 kilometers of levees and canals, 150 gates and other water-control structures, and 16 major pump stations. This engineering success altered the quantity, distribution, and timing of fresh water entering the Everglades. Beginning in the 1960s and continuing through the 1990s, an increased awareness of the importance of wetlands fostered a movement to protect and preserve this unique ecosystem. In 1994, Florida Governor Layton Chiles signed the Everglades Forever Act, which ended a 6-year lawsuit brought by the federal government against the State of Florida for failing to protect the Everglades. This act addressed the issue of fertilizer runoff from sugar and vegetable farms by creating filter marshes to absorb fertilizers, particularly phosphorous. In July 1999, the U.S. Army Corps of Engineers submitted a Comprehensive Everglades Restoration Plan (CERP) expected to cost at least $8 billion and take 20 to 30 years to complete. If implemented, CERP will rework the massive Everglades drainage system to mimic natural functions of the system. Only time will tell whether these efforts will be successful in rescuing the Everglades, one of the most threatened ecosystems in the United States. SEE ALSO Douglas, Marjory Stoneman ; Florida, Water Management in . Lodge, Thomas E. The Everglades Handbook, Understanding the Ecosystem. DelrayBeach, FL: St. Lucie Press, 1994. Caulfield, Patricia. Everglades. San Francisco, CA: Sierra Club/Ballantine Books,1970. Davis, Steven M., and John C. Ogden, eds. Everglades: The Ecosystem and Its Restoration. Delray Beach, FL: St. Lucie Press, 1994. Fernald, Edward A., and Elizabeth Purdum, eds. Water Atlas of Florida. Institute ofScience and Public Affairs, Florida State University. Tallahassee, FL: University Press, 1998. Milon, J. Walter et al. "Public Preferences and Economic Values for Restoration of the Everglades/South Florida Ecosystem." In Economic Report 99-1. University of Florida, Food and Resources Economics Department. Caulfield, Patricia. 1997 Everglades Annual Report. South Florida Water ManagementDistrict. <http://www.dep.state.fl.us/water/everglades/docs/97report.pdf> .